Trump on finding a DACA fix: "We're ready, willing and able"
President Trump blamed Democrat "obstructionists" for not providing a lasting fix to DACA (Deferred Action on Childhood Arrivals) and said the administraiton is ready to find a solution to current immigration disputes while delivering remarks at the Latino Coalition's Legislative Summit in Washington, D.C. on Wednesday. He addressed the Hispanic community where he largely stuck to his administration's wins including providing an overhaul to the nation's tax code and job creation. He noted, however, that Democrats "don't want to solve the problem" of immigration. "We're trying to have a DACA victory by the way and Democrats are nowhere to be found, it's really terrible," said Mr. Trump. He added, "We're ready, ready willing and able, but they are no where to be found." 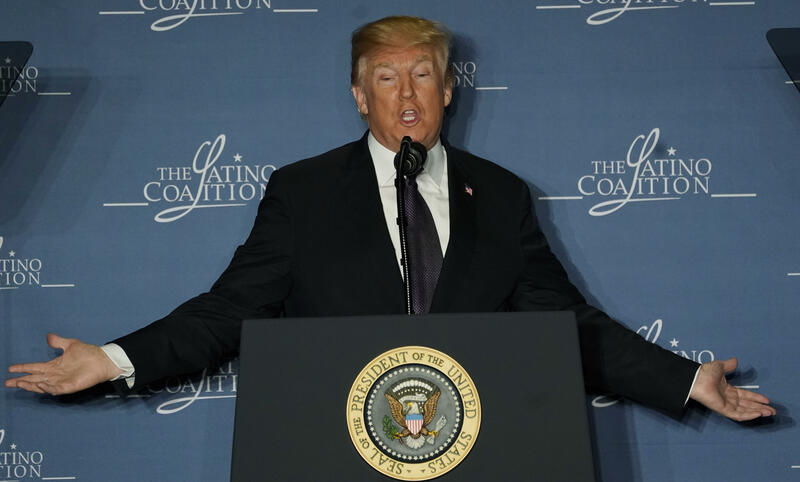 The president claimed that Democrats instead are refusing to approve his administration's own immigration plan because "they'd rather use it to to get elected, and that's not working so well." He claimed that the White House's reforms are "supported by a vast majority of Latino voters" and that skill-based immigration is the "mainstream view of all Americans" yet "Senate Democrats filibustered our plan." The Senate rejected all four immigration proposals brought to the Senate floor late last month, dimming hopes for a breakthrough on immigration anytime soon. The proposal that failed by the most votes was the one that reflected Mr. Trump's four must-have immigration pillars — a path to citizenship for DREAMers, $25 billion for border security and the wall, an end to the diversity visa lottery program and an end to family-based or "chain migration." Mr. Trump later urged the crowd of Latino business owners and coalition members "this is our time, this is our moment, go get DACA go push those Democrats. This is a moment for DACA, for all of us, but this is a very special moment." The president's message to the Hispanic community also comes during a particularly turbulent time for the administration's relationship with Latinos. Most recently a plan for Mexico's President Enrique Pena Nieto to visit the White House has now been put on hold following a particularly contentious phone call between the two leaders, ending yet again in an impasse over Mr. Trump's long-awaited border wall between the U.S. and Mexico. Mr. Trump has hailed his "big beautiful wall" as a measure to stop the flow of drugs and immigrants from coming into the U.S. while Pena Nieto argues the wall is more of an insult and has refused to foot the bill. Meanwhile, Mr. Trump's son-in-law Jared Kushner will be paying a visit to Mexico City on Wednesday in an effort to quell the ongoing tensions and push for the administration's security, trade and immigration policies.